Is it really important to have a translated resume? Should a picture be included? How should you format your resume? Take a look at the following tips from our CEO and go for the gold! A resume is your letter of presentation for any project or job you may want to apply for. That is why it is important to bear in mind some essentials when drafting or, if you already have one, modifying, your resume. Although for the most part the following tips apply to any profession, if you are a translator, there are some key issues you should be particularly paying attention to. What would happen if you are applying for a translation job and your resume is poorly translated? How relevant is it to include a picture when the target job is one that relies more on your skills than on your looks? Is it advisable to have more than one version of your resume? Below our CEO Cynthia Farber gives you 10 essential tips for you to consider when drafting your translator’s resume. Can you come up with any other tips? Leave a comment below! Include an appropriate professional profile picture. We sometimes like a picture we were taken with a friend or a relative and, as we think we look good, we include it without taking into consideration if it is cropped or too enlarged, or if it does not portray a serious and professional profile. It is essential to include a picture which makes you look professional. No, we are not talking about a picture taken with a high-quality camera or against a flawless white background (which is actually a great idea). You can have your photo taken by a friend with a good light source on a plain background (make it a library, your desk, the park). If you can afford it, don’t think twice and have your photo taken by a professional. Our profile pictures were taken by photographer Vanina Suriano from Estudio Inmarcat. If you will be sending your resume to a US potential client, you may want not to include a picture due to discrimination laws and regulations. Keep it up to date. This might seem obvious, but quite often time goes by and we forget to update the information on our resume. We recommend that you keep record of every new thing you do regarding your academic training and professional career as a translator. Write everything down and take some time each month to carefully draft and include that information in your resume. If you do a lot of translation work or handle several assignments, you will probably forget to include them as time passes by and there will be no record of the important projects in which you participated. The format should be professional, too. Avoid the use of shocking colors or illegible fonts. The most important thing is to make it simple, using indentation, headings and overall format properly. In the end, a professional-looking resume will speak to your actual knowledge of Microsoft Office and other related tools. Leave out irrelevant information. Although my previous tip was to keep your resume updated, this does not mean that you have to include the story of your life. For instance, including the name of the grade school or high school you attended is not usually relevant, unless you have good reasons to believe that it actually is (if, say, you completed your primary school studies in an English-speaking country or if you attended a school which belongs to a certain community which has something in common with your potential employer). Use a professional e-mail address. This, too, may sound obvious, but we still get resumes with e-mail addresses that could hardly be said to be professional. It is perfectly ok if this address is the same you use for personal matters, but it should look professional. Investing a little money to buy a host or a domain name is not a big investment and it will certainly give you that special touch. Make sure your contact details are complete and accurate. We know that you have repeated your phone number or address a thousand times. Still, you can make mistakes. Check out whether your phone numbers and addresses are accurately written. Review your entire resume carefully. 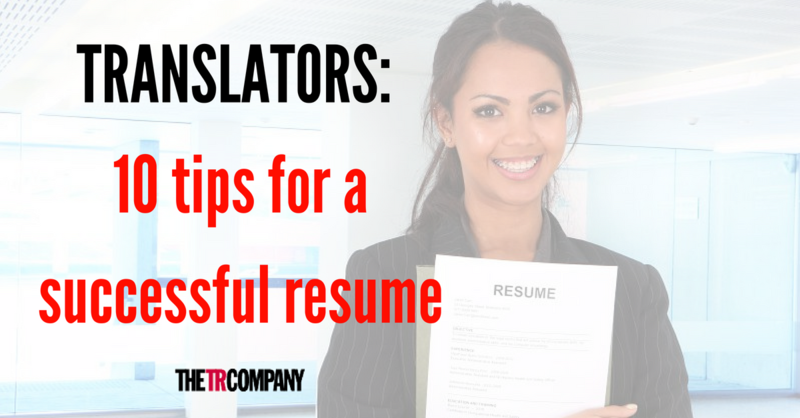 In line with the last two tips, it is essential that you go over your resume several times and, if possible, ask a friend to do the same for you. The drafting and layout of your resume must be spotless. Try to define what information you are going to give about each educational institution or job, and repeat the same information for all of them. You should do the same with the term during which you took a particular course or the period in which you worked at a certain place: it is best to include them in all cases. Get information and advice. Read books or visit web sites on the topic: there are many, and some really good ones, both in English and Spanish. Draft a version in Spanish and another one in English (or the language you work with). Even if this tip is at the end of the list, it is no less important. Do not underestimate the fact that your translated resume is the first sample of your work as a translator. Tailor your resume to the job you are applying for. Finally, try to customize your resume and cover letter to fit the job you wish to apply for. This will allow your potential client or employer to find out about your experience in the relevant field. In addition, if you have a lot of experience and your resume is more than two pages’ long, this will help you shorten it. At the “Resume Drafting” Webinar scheduled for mid-June, our CEO Cynthia Farber will elaborate on these tips. During this online meeting, Cynthia will address your questions/queries as regards the drafting of a resume: what to include and how, which format is the most appropriate, whether or not it should include a picture, what happens if you have no experience at all, what happens if you do not have a specialization, whether fees should be stated, among other questions posed by our colleagues. The date is yet to be confirmed but, if you are interested in participating, send an e-mail to info@thetrcompany.com and we will let you know the exact Webinar date as soon as it is confirmed.